Free download LameXP latest version. 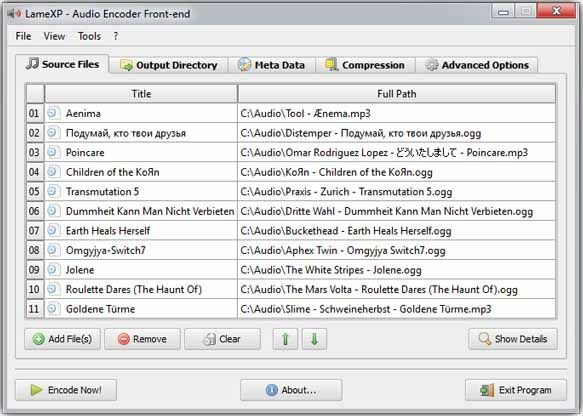 LameXP is a graphical user-interface (front-end) for various of audio encoders: It allows you to convert your audio files from one audio format to another one in the most simple way. Despite its name, LameXP is not only a front-end for the LAME MP3 encoder, but supports a wide range of output formats, including MP3, Ogg Vorbis, Opus, AAC/MP4, FLAC, AC-3 and Wave Audio. The number of supported input formats is even bigger! Furthermore LameXP not only runs on Windows XP, but also on Windows 7, 8 and 10 as well as many other operating systems. Since all the encoders and decoders that are used by the LameXP software are already built-in (with one exception), you do not need to install any additional software, such as “Codecs”, “Filters” or “Plug-ins”, on your computer. Everything works “out of the box”. You can even use LameXP as a “portable” application, i.e. you can run LameXP directly off your USB stick. Moreover, LameXP was designed for batch processing. This means that you can convert a huge number of audio files, e.g. a complete album or even your entire music collection, in just a single step. At the same time, LameXP is able to process several audio files concurrently, so it can take full advantage of modern multi-core processors! However, LameXP is not only optimized for speed, it also provides excellent sound quality by using the most sophisticated audio encoders currently available. In addition to that, LameXP provides full support for meta information, including cover artwork. So when converting your audio files with LameXP, any existing meta information will be retained – to the highest possible extent. Of course, there also is an easy-to-use meta-tag editor for adding new meta information or managing the existing meta information. On top of it all, LameXP provides full Unicode support, for meta information as well as file names, thus problems with “intentional” character sets are avoided. Likewise, thanks to our translators, the user-interface of the LameXP software is available in many different languages, including English, German, Spanish and Chinese. Last but not least, LameXP supports a number of post-processing filters, including sample rate conversion, normalization (gain adjustment), tone adjustment as well as down-mixing.